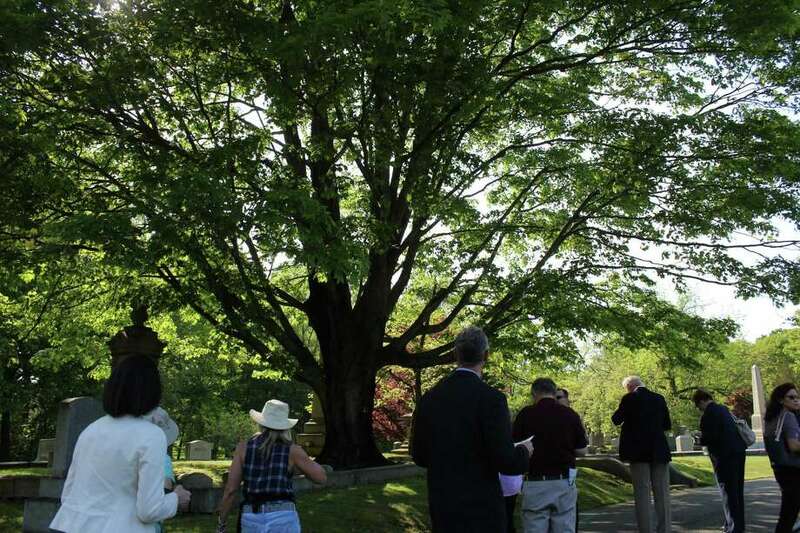 A large sugar maple has the attention of those taking an audio walking tour of the Oak Lawn Cemetery and Arboretum. FAIRFIELD — Oak Lawn Cemetery is the final resting place for some well-known people, like Jason Robards and Mary Tyler Moore, along with scores of the town’s founding families. But it’s also a certified arboretum, one of only two in the state of Connecticut, and the only one in a cemetery. And Bronson Hawley, president of Oak Lawn, wants people to come and enjoy the more than 100 acres at 1530 Bronson Road. One area along the Mill River was choked with invasive plants, but Hawley said those have been removed and replaced with native plants and hardwoods., thanks to two grants from the state Department of Energy and Environmental Protection. “It’s a beautiful, beautiful area,” Hawley said. There are five miles of roadway for walking and bicycles, and nature trails established in 2015 by some Boy Scouts as an Eagle Scout project. A Veteran’s Memorial was installed near the entrance in 2014, and in 2015, the association began holding annual bird walks led by the Connecticut Audubon’s Milan Bull. The cemetery association was incorporated in 1865, named for the oak tree that stood across the street from the property’s entrance, and with the intention that the grounds would serve as a botanical garden. The board of directors began planting oak trees along the river bank at the urging of Mable Osgood Wright, founder of the Connecticut Audubon Society. Now, an arboretum committee selects new specimens for the property. The trees included in the audio tour range from mature specimens, like a flowering dogwood, to a rather young Giant Sequoia that’s protected by a fence. It won’t stay small, as they grow to an average height of 280 feet. The tour brochure includes a map and descriptions of the trees, along with a Q code to scan with your smartphone to hear the audio. For more information, visit www.oaklawnct.com. William Allen and Don Parrott were the two main people who put the tour together and spent the time marking and identifying the trees, Hawley said, helping to promote the property as a community resource, and not just a place for funerals.